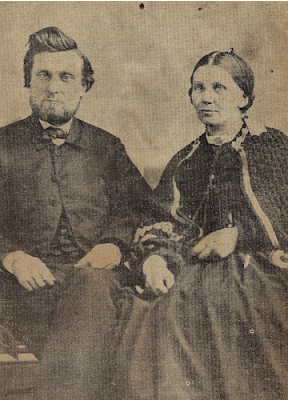 Reverend Levi A. Abbott served as the pastor of the Central Baptist Church of Middleborough from 1863 through 1868 and "he and his wife were greatly beloved by their parishioners." As a Baptist, Abbott was not surprisingly a vocal advocate of temperance, and he frquently spoke to audiences on the topic. In 1868, he was elected to a seat in the Massachusetts House of Representatives from Middleborough. Though the results of the voting were contested and some local residents led by William N. Peirce opposed Abbott's election, the Baptist minister was finally seated and named to the house committee on the sale of alcohol. He later relocated to the Midwest where he passed away in 1919. Below is his obituary from the Alton Evening Telegraph of Alton, Illinois. Rev. Levi A. Abbott, in his ninety-sixth year, entered into his eternal rest this morning at his home, 1608 Henry Street, after an illness of one week. The end came peacefully and members of his family say that while conscious to the last, he did not speak of the approaching change, but that he went out peacefully, quietly, just as he wished it could be. His death was no surprise to his close friends. They had feared that the sickness would prove fatal to the aged gentleman. He had been strong in body and mind for one of so great an age, but it was apparent for some time that he could not survive any serious sickness. His malady was similar to malaria, with fever on alternate days, but his friends thought it was just a wearing out of the old machine that had shown such lasting qualities as to cause all who knew Dr. Abbott to marvel. The funeral will be Sunday afternoon from his late home. Dr. Abbott was a man who had rendered distinguished and lasting service to his fellow-man. For a man who, in boyhood, had very little chance to live because of a predisposition to tuberculosis, Dr. Abbott demonstrated the value of leading an outdoors life. Born at Beverly, Mass., April 19, 1824, he was left an orphan when a baby, and at the age of 14 left school. He became a member of the Baptist Church at the age of 15, and then he went to sea as cabin boy, and in twelve years he served on the sea, he became captain of his vessel. He educated himself, studying chiefly the Bible. He had been desirous of taking up the ministry from boyhood and he finally managed to get one year in the Worcester Academy. During the times he would be home from voyages he would take up the work of teaching and he was prevailed upon to take up the work of teacher in the school he had left at the age of 14. He was elected to the Massachusetts Legislature after entering the ministry, and he was a member of the celebrated War Legislature in Massachusetts. There he was associated with such men as George R. Hoar, Henry Dawes, N. P. Banks, Henry Wilson, and other men who became great in the country's history. Dr. Abbott was ordained at Milford, Mass., in 1855, and was later pastor at Weymouth, Mass., and at Middleboro, Mass. After six and one half years at Middleboro, a trouble in his lungs forced him to leave that climate and he became pastor of the church at Rochester, Minn. With horse, gun, fishing tackle, and general open air work, in four years he got himself into better health. Later he served as pastor at LaCrosse, Wis., for seven years and then was called to the First Baptist Church at Alton, where he served for seventeen and one-half years. Then he served as a trustee, treasurer and comptroller of Shurtleff College for eighteen years. For many years he was a member of the Baptist State Board, and it was he who was entrusted with keeping the records of deaths of other Baptist pastors in the state. One of the most remarkable facts about Dr. Abbott was the perfect preservation of his mental powers and his body. He was a frequent contributor to the Telegraph. He would write poems on patriotic occasions, and his poems at each of his last four or five birthday anniversaries were something for a man of his years to be proud of. He was a deeply religious man, possessed of a temper that made him beloved by all who knew him. It is a fact related by his friends and was admitted by Dr. Abbott, that he probably never uttered a prayer nor preached a sermon omitting some imagery of the sea. He used for his illustrations something about the sea, and he seemed at a loss to find anything that would so well fit into a discourse or a prayer as a figure of speech. He was one of the most ardent supporters of the Telegraph, and held this paper in the highest regard. As an illustration of his feeling for the paper he presented to the Telegraph one day a verse which, he said, he had read eighty years before, when a boy, in a newspaper office in the East. It was given a place of honor in the Telegraph, as he said that he believed it fitted this paper. It runs as follows: "Here shall the press, the people's rights maintain, Unawed by influence, unbribed by gain, And from the Truth our glorious precepts draw, Pledged to Religion, Liberty and Law." Dr. Abbott was one of the most regular visitors at the public library. He read much and he would come down town, even up to a few weeks ago, to get his regular allotment of the latest books. He kept up with every great movement, was conversant on all great questions. Few men are found entertaining, showed so much sprightliness, and such vigor of mind and body as he. Dr. Abbott leaves his wife, Mrs. Mary Abbott, and three children: Augustus L. Abbott, Grace A. Blair, and Mary L. Epps.